← The overall direction is set! Before I begin to explore and explain the benefits, difficulties, and uses of mindfulness and awareness such as the P.A.U.S.E. technique in education, I feel I need to communicate my perspective, and general philosophy (prepare the soil). Let’s begin with defining mindfulness and awareness (planting the seeds). There are many ways to perceive and understand both of these terms. This is my working definition, so everyone knows the basics I work from. Mindfulness is purposely paying attention with non-judgment and can also be understood as general awareness of self and others. There is a spectrum with focus and fine concentration being at one end of the spectrum and open perception of everything being on the other. Furthermore, I will be taking mindfulness from the Western psychological perspective, proposed by Ellen Langer (1989), explaining that it can be dividing into four domains such as novelty producing, flexibility, novelty seeking, and engagement. Together these domains describe a person’s relative openness to experience, willingness to challenge strict categories, and continual reassessment of the environment and their reactions to it. Novelty producing is the measure of propensity (natural tendency) to develop new ideas and ways of looking at things. Novelty seeking is the measure of propensity (natural tendency) to explore and engage novel stimuli. It refers to a tendency to perceive every situation as “new.” This type of person is likely to be more interested in experiencing a variety of stimuli, rather than mastering a specific situation. This is one of two awareness domains of mindfulness. *Engagement refers to the propensity (natural tendency) to become involved in any given situation. An individual who scores high in engagement is likely to notice or see the “big picture.” This is the second “awareness” component of mindfulness. Flexibility is the belief and understanding in the fluidity of information, and the importance of welcoming a changing environment rather than resisting it. Flexibility in this case refers to someone who can view a situation from multiple perspectives and recognized that each perspective has equal value. The flexible person operates as though reality were in a social construction subject to continual re-evaluation. To continue and prepare the soil, I also need to explain I hold a combined philosophical, overlapping theoretical, and conceptual framework that would be nice to know before I go further (diagram below). Obviously, mindfulness is on component. Another large concept is stress and burnout, which is normally measured by emotional exhaustion, depersonalization, and sense of accomplishment (Maslach, 1996). Additionally, making educational or classroom decisions are mostly based on cognitive dissonance theory (Festinger, 1962) and choice theory (Glasser, 1985). Together these theories outline a process, which includes a person weighing options of thoughts, beliefs, and experiences to make a decision that is based on collaboration, self-worth, and positive outcomes. Lastly, the eastern philosophy of perception and meditation with regards to mindfulness practice such as following the breath and noticing sensations is the last major overlapping component. 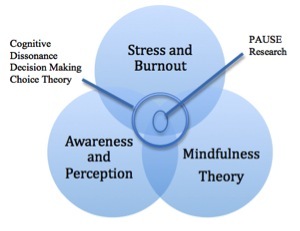 This framework gave me the lens for my research on Vipassana Meditation and Teacher Decision-making (Glogowski, 2012) to uncover the 3-phased Awareness (Anicca) Perspective Decision-making Process. 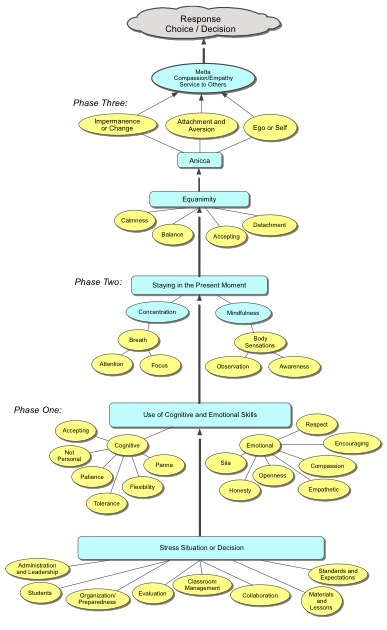 Phase one is basically the standard cognitive decision-making where we face a stressor, weigh the options (thought and emotion), and make a decision, or act, but arguably re-act. Phase two is where mindfulness takes place with adding focus and awareness of you, others, and the surroundings to the present moment. Finally, in phase three the eastern philosophies come into play such as equanimity, detachment, impermanence, ego, and responding with compassion. The overall process is outlined in the below diagram. Ultimately, these outlined settings (theories), background (framework), and process allowed me to create the P.A.U.S.E technique to remind people (teachers and students) how to respond verses reacting to situations. The word PAUSE is an acronym. The “P” stands for pause liter- ally. It reminds one to slow down, take time, think, and feel. The “A” stands for awareness, that includes using all senses to take in the surroundings, situation, people, and self against a backdrop of impermanence. The “U” stands for understand, which means working through equanimity and balancing all the elements brought in through awareness with an objective of detachment and non-judgment. The “S” stands for sensations and self, which is a reminder to monitor the breath and body sensations while working through equanimity. The “E” stands for empathic engagement, which is a reminder to connect with other people while making decisive action and engaging. The below is what I have posted in my classroom and teach my students. I teach and use this technique in all of my 6, 7, and 8 grade classes as a bell-ringer activity or is an end to my vocal warm-ups. I explain that the exercise goal or focus is to help support mind training over the body through increasing awareness and attention by staying as still as possible while noticing breath and sensation without judgment. Eventually, they can do it by themselves without my guidance. For more details about my general educational philosophy they can be found here. Also, more about a similar organization doing similar work – mindful schools here. Festinger, L. (1962). A theory of cognitive dissonance. Stanford, Calif.: Stanford University Press. Glasser, W. (1998). Choice theory: A new psychology of personal freedom. New York: Harper Collins Publishers. Glogowski, J. R. (2012). Vipassana Meditation and Teacher Decision-Making. Dissertation Abstract International, 73(10). (UMI No. AAT 3510201), From Dissertations and Theses database. Goenka, S. N. (2002). Meditation now: Inner peace through inner wisdom. Seattle, WA: Vipassana Research Publications. Goenka, S. N. (2005). Vipassana meditation, guidelines for practice. Seattle, WA: Vipassana Research Publications. Goenka, S. N., & Hart, W. (2000). The discourse summaries: Talks from a ten-day course in vipassana meditation. Seattle: Vipassana Research Publications. Langer, E. J. (1989). Mindfulness. Reading, Mass. : Addison-Wesley Pub. Co.
Maslach, C., Jackson, S.E, & Leiter, M.P. MBI: The Maslach Burnout Inventory: Manual. Palo Alto: Consulting Psychologists Press, 1996. Dr. Jeffrey Glogowski is a middle school music teacher and choral director of 17 years, currently teaching at Herget Middle School in the West Aurora School District. His foundational study about “Vipassana Meditation and Teacher Decision-making” has set the stage for more research that encourages teachers and students to explore life through the use of mindfulness, awareness of thoughts, and self-reflection as a means of nurturing the spirit while learning music. He enjoys using music as a vehicle to help others find their full potential and self worth. This entry was posted in Awareness, Burnout, Choice Theory, Cognitive Dissonance, Decision making, Education, Meditation, Mindfulness, Perception, Stress and tagged Choice Theory, Cognitive Dissonance, Decision making, Meditation, Mindfulness, Perception, Philosophy. Bookmark the permalink. I’m so happy you’re doing this work in the world. It’s truly revolutionary.